I recently returned from a meeting in New York City of specially invited classical radio professionals called together to discuss the future of classical music on the radio. It was a stimulating and congenial conversation hosted by WNYC at their future location (appropriately enough) in Lower Manhattan. The stations and producers represented a variety of approaches to classical radio programming, but I think it’s accurate to say that they fell into two broad camps: those who are interested in preserving a tradition, and those who seek to invent a new one for a different kind of listener. I was invited to this gathering primarily because of my work over the past six years on two national research projects undertaken by the Public Radio Program Directors Association. These projects sought a deeper insight into the motivations and preferences of classical radio listeners. Lots of information was generated, but in a nutshell what we learned is that most classical radio listeners experience the music primarily on a spiritual and emotional level. This perception is borne out by the comments we continue to receive at the My Source page WDAV has created to mark its 30th anniversary. We’ve arrived at a point in the classical radio industry where there’s very little dispute about that broad characterization of the listener. What’s also undisputed is that the audience for classical music stations has gradually been contracting over the past decade. WDAV is not an exception to that trend, even as our listeners report higher levels of satisfaction with the station, and our fundraising has grown more and more successful – but then, public radio has always relied on a generous and passionate minority to support the listening of the many. What some stations, such as WNYC in New York, are proposing is to target a different kind of listener, since traditional classical radio doesn’t appear to be what you would call a “growth industry.” They’re looking for a listener who’s more intellectually engaged with the music, more open to other cultural influences, and is generally more forward looking (as opposed to seeking escape in the glorious traditions and accomplishments of the past). A good example of their approach is their Evening Music , hosted by a bright, young announcer who mixes in music from other genres, emphasizes new music, has occasional unconventional guests in the studio (such as the adult film star interviewed recently), and continuously solicits real time listener engagement through the program’s blog . Prominent music critic Greg Sandow has called this approach “the future of classical music,” and for all I know, he may be right. What I do feel I know, from my nearly fourteen years of experience here at WDAV and the recent research projects I’ve been involved with, is that an approach like that would also alienate a majority of our most loyal current listeners, the ones who’ve invested in our station and made it what it is today. It’s not a choice to be made lightly, and yet it doesn’t appear to be a choice that can be avoided, because there doesn’t seem to be a lot of common ground between these two groups. One thing is certain: classical radio is definitely at a crossroads. That’s especially true for WDAV as we approach our 30th anniversary. As always, we’d be interested to know what you think. How about adding a program called “classical country music”? You could play Hank Williams, Patsy Cline, etc. Seriously, I recommend you stick with the formula that works here and that is the traditional classical music with a small sprinkling of contemporary classical and not use the New York model. Interviews should be kept to minimum. One of the things that has continually given a boost to classical music listening has been the appearance of a certain piece of music in a popular tv show or motion picture. Mozart 21st Piano Concerto in “Elvia Madigan,” Albinoni’s Adagio in G minor in “Flash Dance.” The list goes on and on. And that’s precisely it. By associating classical music with modern media, we may attract new classical music fans. What WDAV does right now is great. I listen all day. But can we some day see the Mozart Cafe with Jennifer Foster and Elvira Madigan? Google provides a good model with their search. I search, they give results and a few unobtrusive ads that may interest me. I’m not saying advertise but associate. I travel all over the country, and I have spent considerable time in cities with renowned symphony orchestras like Chicago, Cleveland, Detroit and Philadelphia. 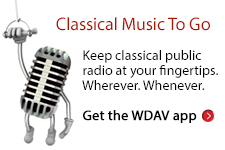 I’ve listened to classical music radio in those cities and I’ll stay with WDAV any time. Some of those stations change their identity, genre, during the course of the day which is a turn off to me, and turn off is what I end up doing with the radio. If the audience for classical music in contracting, you don’t change classical music. You find ways to expand that audience. Otherwise what have you accomplished? You’ve attracted more people to a station that is no longer a classical music station. Consider collaborative efforts with local orchestras, ballets, opera, theaters and artist. Reach out to schools of art, colleges and don’t forget elementary, middle and high schools. There you will find kids of all ages doing music, including classical music. Don’t let them slip away. There lies the future. If your audience is contracting, don’t contract your product. Expand your marketing to reach a wider audience. It’s wonderful to hear these comments! Thanks for sharing your thoughts and suggestions, and keeping the conversation going. WDAV, What WNYC is attempting to accomplish is suicide. I have been a supporter of that station, going back to when it was only an AM station. Closely tied to the NYC government, the station had to decide, at that time, either give up the radio stations or its new TV station. I was visiting the station, talking to its TV director, when I learned that the TV station was given back to Mayor Guiliani that very day! I felt very sorry for the TV director, and very bitter for what their Board of Directors did. And since then WNYC has caused me to drop my membership. By the way they didn’t inform the listener of the meeting you attended. But I am not surprised by your article. They are not truly a classical music station. WQXR is the only classical music station in NY City and has been my friend since it began in 1936. I hope that WNYC will not influence other stations to follow their way of trying to reach out for more listeners. On the internet I have stations like yours to visit as often as I please. Thank you for continuing to be a classical music station. These comments by your listeners reveal just how we react to the current topic. Let me make certain to reassure WDAV listeners, whether you’re in the Charlotte area or online,that nothing of the sort is contemplated here. It would be a clear betrayal of the listeners who currently support us, and would probably just hasten our doom,in my opinion. And what’s encouraging about your remarks so far is that you feel very strongly that the problem is not the product but, in a sense,its marketing (or lack thereof). In other words, you seem to think there are people out there who could be reached and added to the audience if we made the right efforts. I certainly hope that’s true. Does anyone disagree? It would be interesting to hear dissent,too (but I promise you,WDAV isn’t moving away from pure classical music if I have anything to do with it). Don’t change a thing. WDAV is a special part of my life and I can always count on knowing that true and traditional classical music is available to me daily at home and in the car. I stopped contributing to WFDD because they changed from a traditional classical station. I have many friends here in Winston-Salem who feel the same way. Thanks for the wonderful music. Keep it coming!